The South Fork’s long season and its close proximity to Sacramento, Lake Tahoe, Yosemite and the San Francisco Bay Area make this an extremely accessible river trip. This all-day trip combines both the Chili Bar section of the South Fork and the Gorge. Once everyone has arrived, the guides will deliver an orientation and safety talk and fit you with your safety gear. We will then take a 25-minute shuttle ride to the Chili Bar put-in point, where your boats and the rest of your OARS crew await. After practicing your paddle-strokes, the morning starts off with a bang in Meatgrinder rapid! More fun and exciting rapids like Racehorse Bend, Maya and the famous Troublemaker Falls await you downstream. 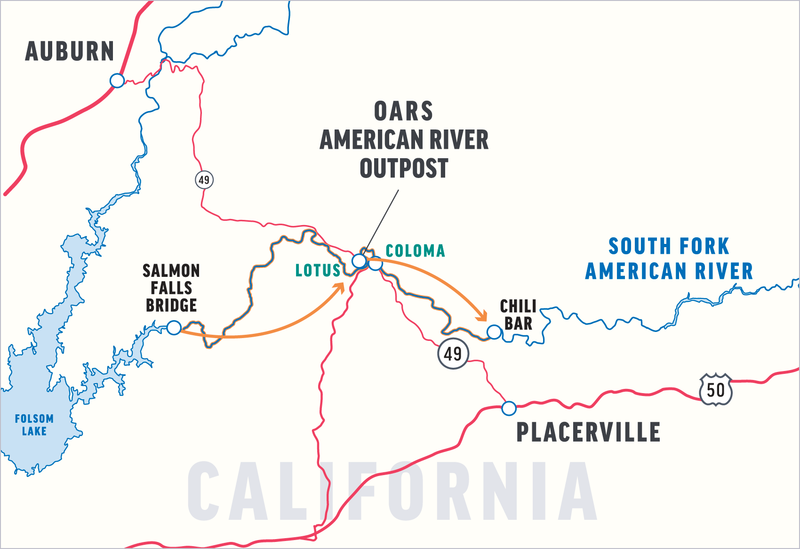 Once we float past the historic town of Coloma, where gold was originally discovered in 1848, we’ll stop on a sandy beach for a delicious picnic. Your guides will lay out an abundant spread of cold cuts, cheeses, veggies and breads. Lunch is always accompanied by fruit, cookies, cold water and lemonade. There will be a restroom facility available at lunch. After the main rapids are over and depending on the water levels, the guides will tie the boats together for a short tow-out to the Salmon Falls Bridge. From the water’s edge, there is a short, steep hill up to the parking lot where our shuttle vehicle, and restroom facilities, awaits you. If you’re feeling fit, our guides appreciate help carrying the rafts and other equipment up the hill. Please feel free to bow out if you wish. 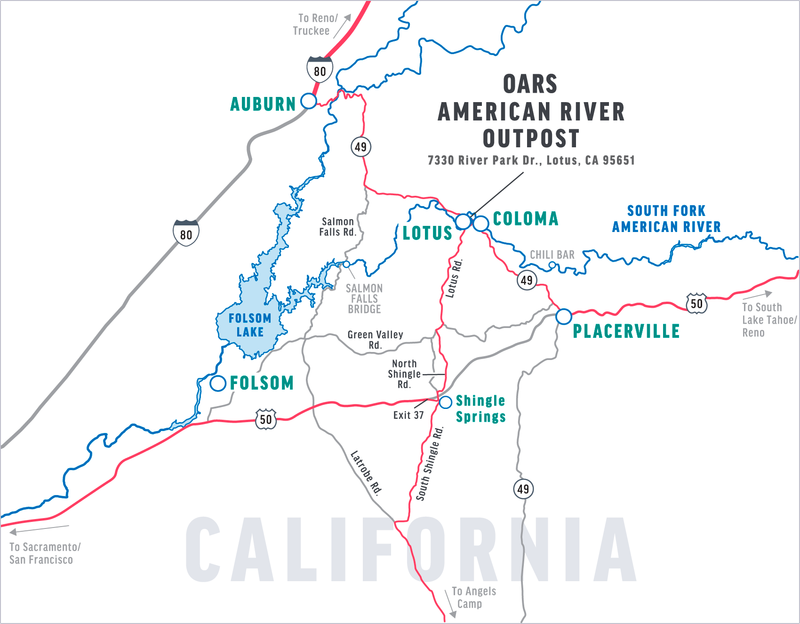 After enjoying a cold soda or sparkling water from the cooler, we’ll head back to the OARS American River Outpost and your car, arriving around 5:00 PM. From Sacramento on U.S. Hwy 50: Follow Hwy 50 east toward Placerville and South Lake Tahoe. Take the Ponderosa Road exit (Exit #37), turn left onto Ponderosa/S. Shingle Road and cross over the freeway. At the second stoplight, take the right turn on N. Shingle Rd toward Coloma/Lotus. O.A.R.S. West, Inc. and cooperating agencies act only in the capacity of agent for the participants in all matters relating to transportation and/or all other related travel services, and assume no responsibility however caused for injury, loss or damage to person or property in connection with any service, including but not limited to that resulting directly or indirectly from acts of God, detention, annoyance, delays and expenses arising from quarantine, strikes, theft, pilferage, force majeure, failure of any means of conveyance to arrive or depart as scheduled, civil disturbances, government restrictions or regulations, and discrepancies or change in transit over which it has no control. Reasonable changes in itinerary may be made where deemed advisable for the comfort and well being of the participants, including cancellation due to water fluctuation, insufficient bookings (this trip requires a minimum of 6 guests), and other factors. There is risk in whitewater rafting, particularly during high-water conditions. Rafts and kayaks can capsize. You could be swept overboard. Your guide will make every attempt to assist, but you must be strong and agile enough to “self-help” and “float-it-out” without further endangering yourself or others. We reserve the right not to accept passengers weighing more than 260 pounds or with a waist/chest size exceeding 56 inches. We may decide, at any time, to exclude any person or group for any reason we feel is related to the safety of our trips. We are experienced at accommodating people with various disabilities. Please give us an opportunity to make you feel welcome. We need to discuss any special requirements ahead of time. On advancement of deposit the depositor agrees to be bound by the above recited terms and conditions. Prices subject to change without notice.